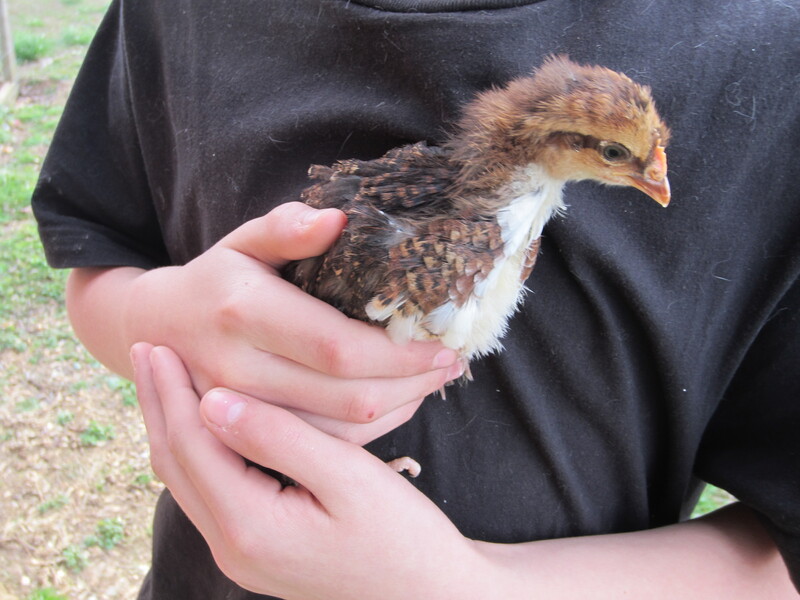 Speckled Sussex Chicks Are Now 3 Weeks Old! It’s hard to believe that we’ve had these little ones for 3 weeks now! They’ve hit what we have dubbed the “ugly duckling” stage. They still have a lot of the baby down, but are also getting in a lot of their beautiful feathers. But, it’s such a mix that they are not very pretty at this stage. But, the beauty is coming! 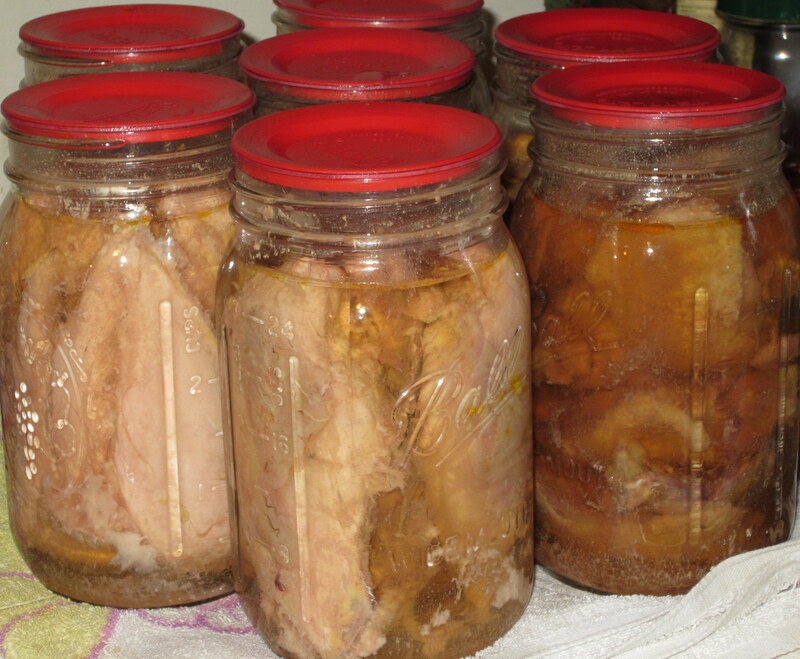 As I promised, this post is going to update you on my thoughts on canning chicken raw. Here’s a pic of the jars after they had cooled & been washed off. Well, as it happened, I canned this on a Thursday and then had the perfect opportunity to give it a try when I found out that a dear, sweet friend of mine came back from her camping trip sick. Her sweet little girl came down with a stomach bug on the way home, & then she came down with it. So, I fixed a big pot of homemade chicken noodle soup. I had all the ingredients in my pantry, including some store-bought egg noodles, so it was super easy & quick to throw together. I made enough for both her family and mine for supper that night. 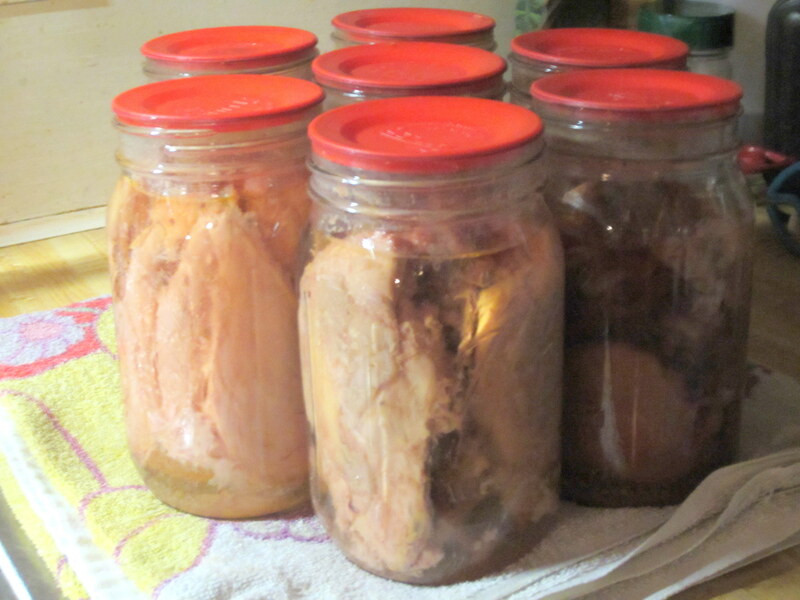 Canned chicken after removing from jar. 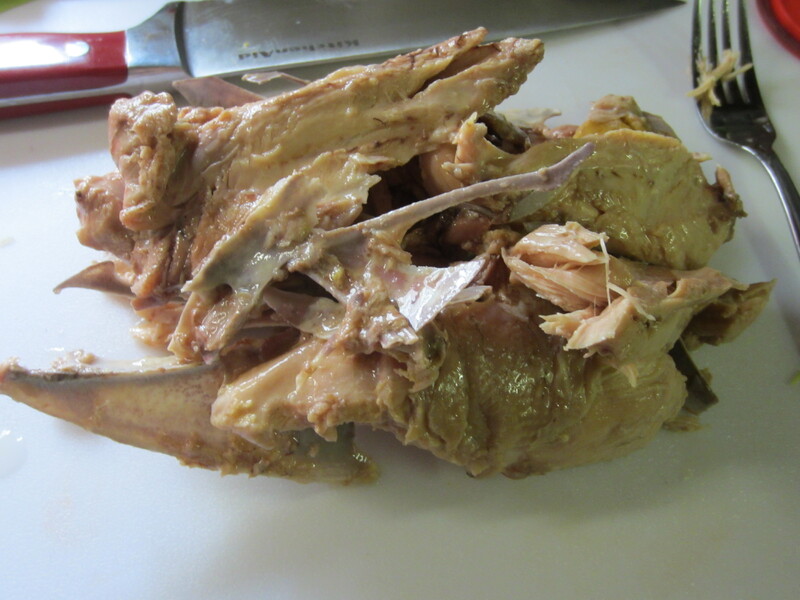 Here’s what the chicken looked like after I pulled it out of the jar. Remember my telling you that these roosters were a little over a year old? Most birds at this age are starting to get chewy & tough. When I pulled these four chicken breasts out of the jar, they literally fell off the bone! It was so tender & juicy, you would’ve thought that these were very young, tender birds if I hadn’t told you any different. 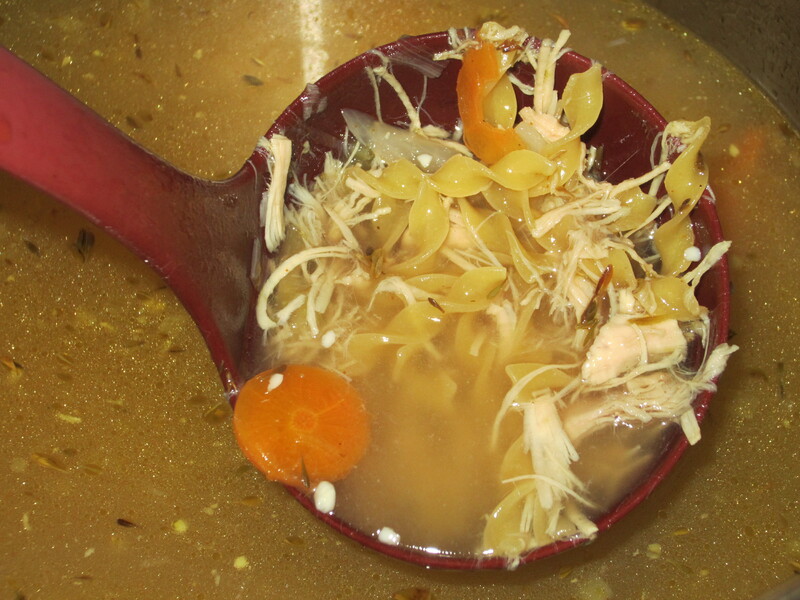 Chicken noodle soup made with home canned chicken. In fact, look what happened when I put it in the soup pot. It literally fell apart. It looks like a put shredded chicken in the pot when, in fact, I just cut it into bite-sized chunks before placing it in the pot. The taste was great! It was very moist & tender. I will definitely be doing this again in the near future. In fact, I have a few bags of frozen chicken that were some of our older birds. These will now be canned up first chance I get. It definitely makes it quicker & easier to throw a meal together this way. This past week, a friend of mine was giving away 4 roosters, which I was happy to take off of her hands. We picked them up on Tuesday and then processed them Wednesday morning before our weather turned cold (again). Since we didn’t have anything invested in them but time, I figured these would be great to try my hand a canning raw chicken! I followed the instructions in my Ball Blue Book & covered them with water, leaving 1 inch head space. 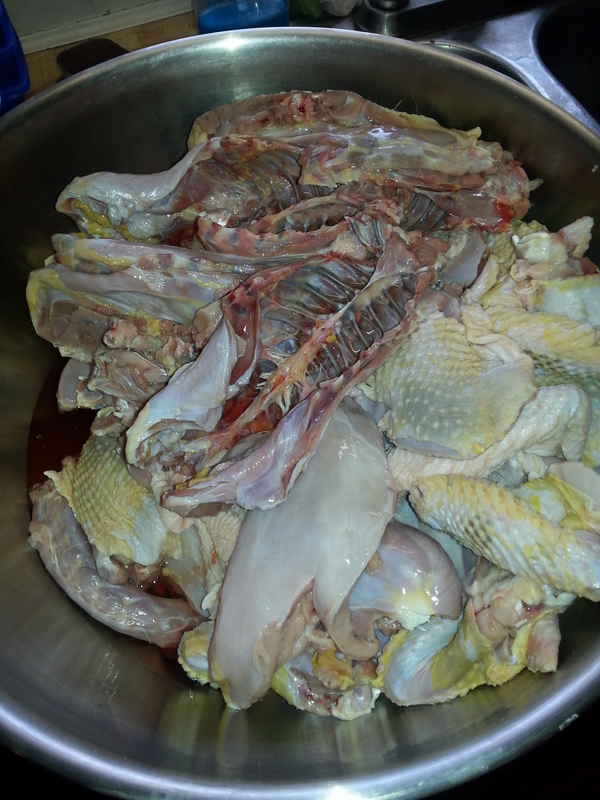 I canned the quarts of raw, bone-in chicken for 75 minutes at 10 pounds of pressure. While the chicken was in the pressure canner. I put the backs, necks, wing tips, hearts & veggie scraps into my roaster & added a splash of vinegar, some salt, peppercorns, & bay leaves, covered with water & cooked all night. I put the chicken livers in the freezer for my dad. We don’t care for them, but he loves them! The process was very easy to do. I canned them in wide-mouth quart jars. Each jar held 4 pieces, and I canned 2 quarts of chicken breasts, 2 quarts chicken thighs, 2 quarts chicken legs, & 1 quart chicken wings – cut apart. I will say that if/when I do this again, I will definitely not put as much water in the jars as is recommended because the raw meat makes its own broth while it is in the pressure canner cooking, and I lost a lot of valuable broth that way. I was also afraid that the jars might now seal since there was so much broth in the water in the canner itself, but they all sealed! I will probably add enough liquid to fill the jar no more than half way. But, you should follow the instructions in the Ball Blue Book for your canning instructions, pressure, and time. After the chicken had been in the pressure canner for the recommended amount of time, I turned the pressure off and let the canner slowly return to zero. Once the pressure returned to zero, and I removed the lid, I removed my jars & tightened the lids down according to Tattler Resuable Canning Lid instructions, covered with a towel, & let cool. All 7 quarts sealed and did wonderfully! They have been washed, dried, & placed on a shelf in my pantry. Since these birds were a little over a year old, they would be a little on the tough side, anyway, so pressure canning the meat should help to tenderize it. The meat will probably be used in either soup or casserole dishes. I will let you know what we think when I get around to opening one in the near future! Here is the post with my update to canning raw chicken. 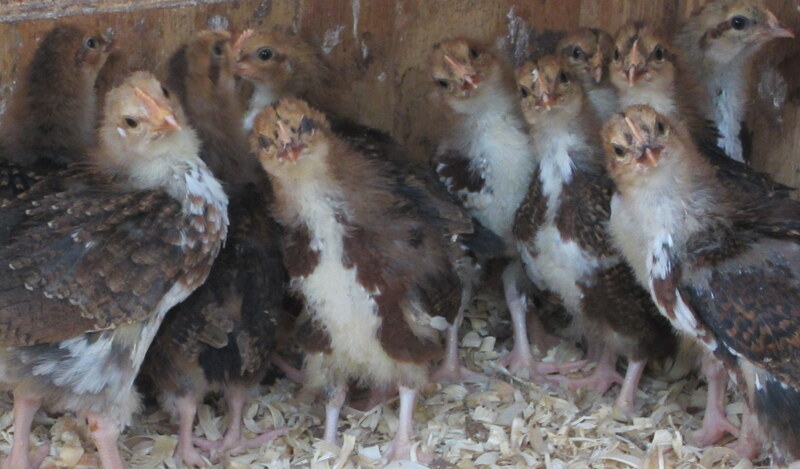 Wednesday, we welcomed 12 new additions to our farm – 12 Speckled Sussex chicks! These are my all-time favorites. 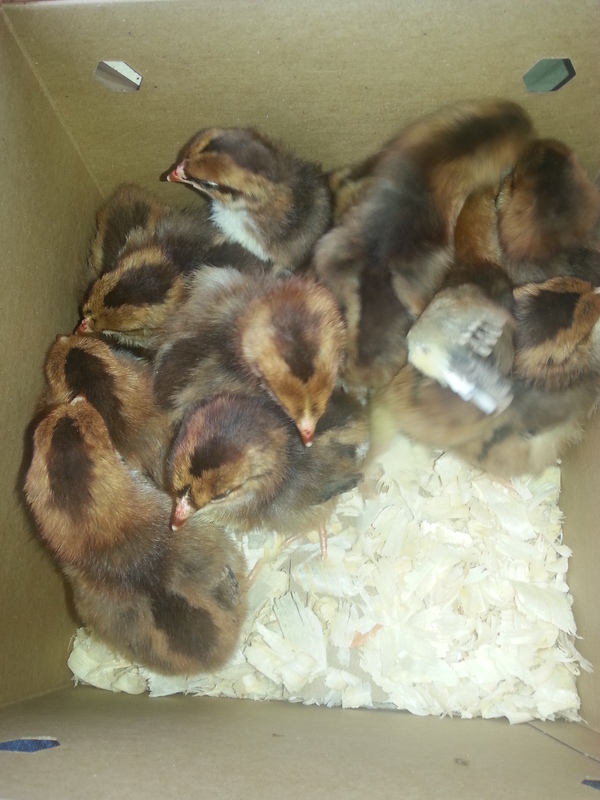 Speckled Sussex chicks on the ride home! The ones I had before were so sweet! And they laid the prettiest eggs! 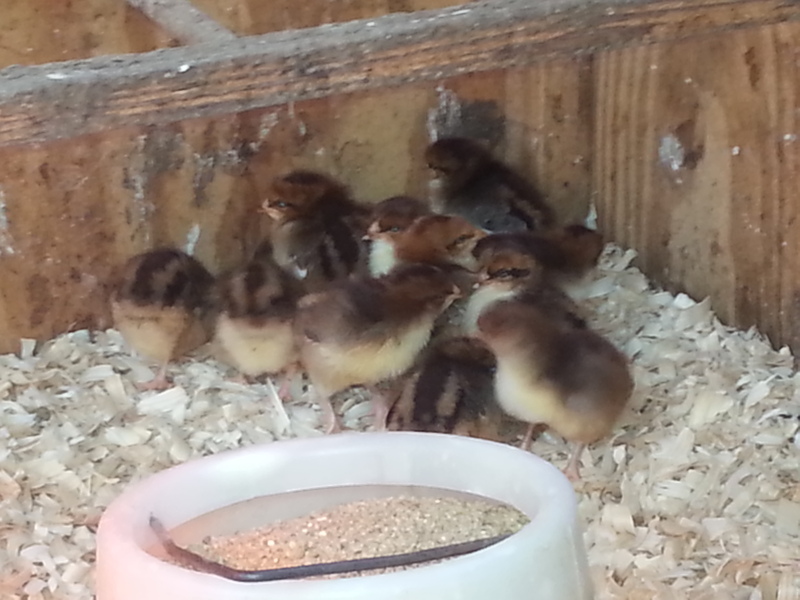 I picked these up at our local Tractor Supply store, so I’m praying they are all healthy & that I have several pullets! 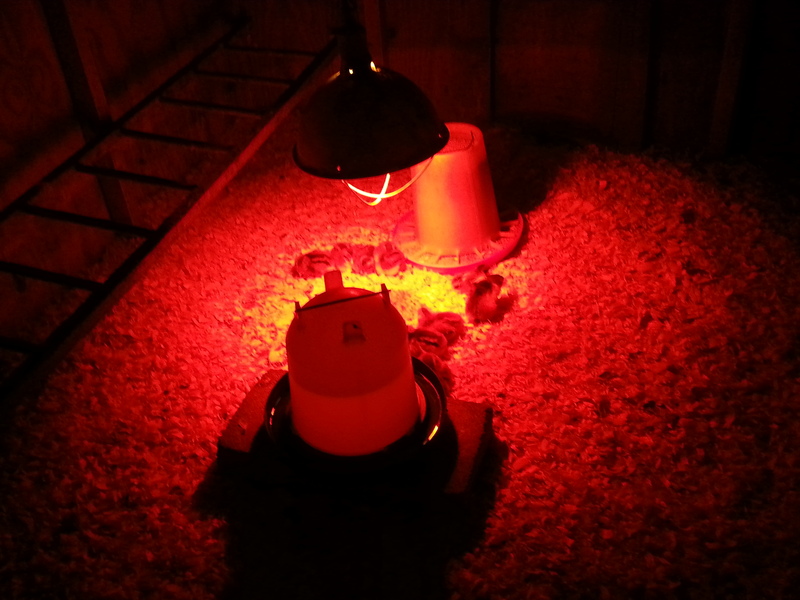 Speckled Sussex chicks – in new home! Here they are – their first night in their new home! Spring Cleaning in the Coop! 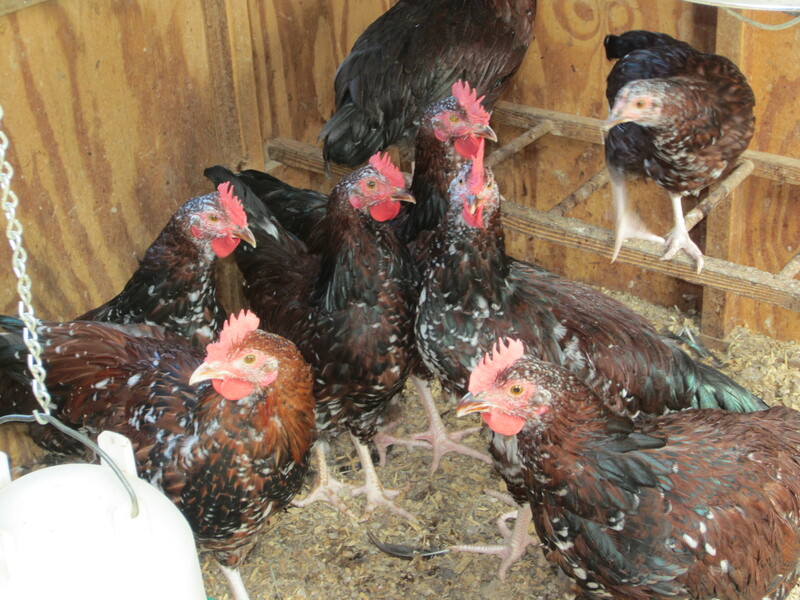 Main Coop – 3 days after putting down fresh bedding! 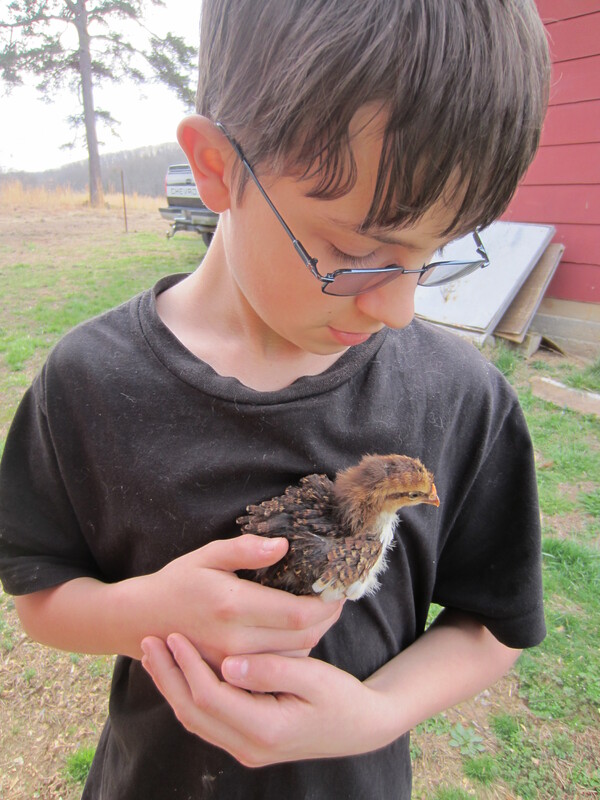 This week gave me the perfect weather for doing a spring cleaning in the coop! The first of the week gave us great spring-like temps, which is what I had been waiting for. Our main coop was in desperate need of being cleaned out after the long winter. During the winter, we have used a variation of the “deep litter” method, which is where you add fresh bedding on top of the “old” bedding periodically instead of removing the old and adding new. This allows a bit more insulation in the colder weather. 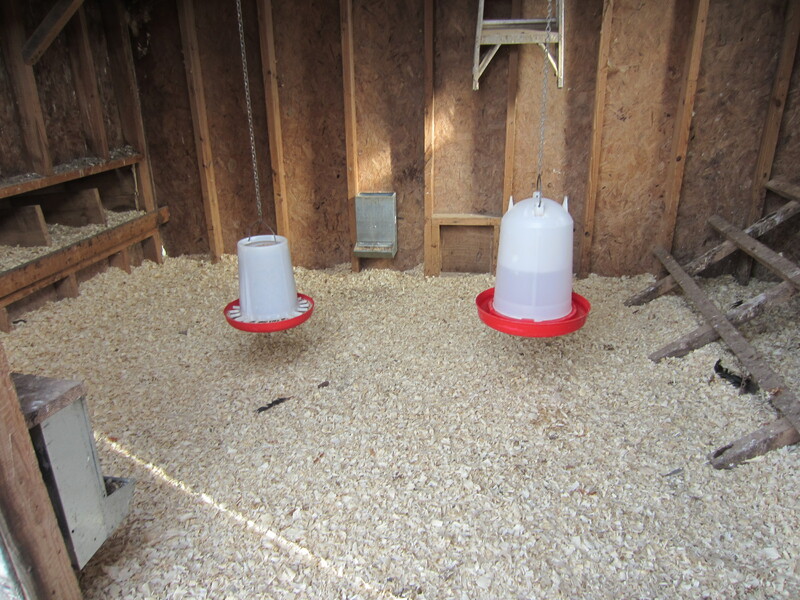 We had already cleaned out from under the roost a few weeks ago, but, when the weather is warmer, we try to do it more often – about every 3-4 weeks. And, it was just time to clean it out. Since we had tackled the worst of it a few weeks ago, I was able to remove all of the old bedding in under an hour! And, it was all moved down to garden area and spread out. This is the really good stuff that is completely broken down & has very little “fresh” poo in it, so my garden will love it! After all the old bedding was removed, I allows the coop to “air out” for a few hours, and my girls enjoyed several hours of free ranging! It’s so funny to watch them chasing after bugs at the beginning of spring. I don’t think they touched their feed all day – just gorged themselves on lots of fresh, tender blades of grass & bugs! I can’t help but laugh at my sweet little Rosey. But her nosiness finally got her into trouble. Thankfully, it was not life-threatening. This past Thursday, Brian was out cutting the garden again and getting it ready to plant on Friday. Of course, he had the normal “battle of the chickens” that he always has. They think that he’s turning the dirt just for them so that they can have all those nice juicy bugs and worms, and they like to walk right in FRONT of the tractor instead of behind it. After he finished and was pulling the tractor back under the shed, he noticed something very odd with my van. Upon closer inspect, I’m sure that you can guess what he saw. There sat Ms. Rosey on my dash! He called me outside to come see this spectacle for myself. If I had known what I was about to witness, I would have grabbed my camera. But, when I saw her in the van, I was not only surprised, but concerned about how long she had been in there, especially with the heat. 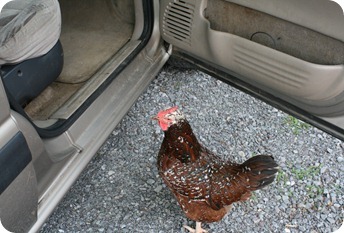 Of course, I had to laugh at the site of the chicken in the van! When I opened the door to the van, she just proceeded to tell me all about her venture in being locked in the van and was not in any hurry to leave. She even objected when I picked her up to put her back out with her feathered friends. Since then, she has continued to insist that she needs to “go” with me every time I get in the van, and she continues to hear that she can’t go with me. Of course, she fusses when I get back and lets me know of her displeasure with me, but a little TLC from me and an extra treat or two for her, all is forgiven and we start the process all over again.